A method based on the north-south atmospheric pressure gradient along the Atlantic coast of Europe could lead to enhanced forecasting of extreme wave conditions and increased preparedness within coastal communities, a new study suggests. Researchers from the University of Plymouth, the Centre National de la Récherche Scientifique, l’Université de Bordeaux and l’Institut Universitaire Européen de la Mer have developed a new climate index, termed the West Europe Pressure Anomaly (WEPA). It is based on the atmospheric pressure difference between the Canary Islands and Ireland, and is very strongly linked to the winter wave variability along most of the west coast of Europe. Initial tests have shown it significantly outscores existing functions, particularly an index called the North Atlantic Oscillation (NAO), which has long been known to affect climate variability in the Northern Hemisphere and wave climate arriving at the coasts of the UK, Portugal, France and Ireland. The NAO index is computed based on the difference in atmospheric pressure between the well-known ‘Azores High’ and ‘Icelandic Low’, and more energetic wave conditions are generally associated with a large atmospheric pressure difference. However, during the 2013/14 winter, when repeated storms battered Europe’s Atlantic coastline (and when the UK was impacted by extensive river flooding), the value for the NAO was far from exceptional, despite the fact that in terms of wave conditions this winter was the most energetic since at least 1948. A study of the new method has been accepted for publication in Geophysical Research Letters, a journal of the American Geophysical Union, with researchers using modelled wave and weather data to generate their findings. 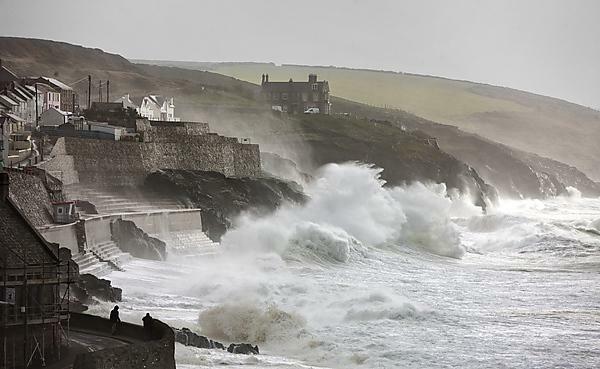 Sea-level rise is by many seen as the major threat for our coast, but previous studies led by the University of Plymouth have shown that extreme wave conditions can induce dramatic coastal erosion that may take many years for the coast to recover; therefore, on the yearly-to-decadal time scale storms may represent a more significant coastal hazard than sea-level rise. Being able to forecast extreme winters is a key issue for coastal management and the climate indicator reported in this study can be an extremely useful tool for making such predictions. Coastal Marine Applied Research (CMAR) is a research-informed consultancy group focusing on coastal processes and marine physics. We are based in the School of Biological and Marine Sciences at Plymouth University, south west UK, and aim to provide a first-class data collection, analysis and synthesis service to help address important issues in the coastal and marine environment. We strive to understand and predict the behaviour of coastal, marine and estuarine systems to support the appropriate management of resources and activities in these environments. The collection, analysis and interpretation of air-, land- and sea-based coastal survey data. Making in-situ measurements of hydrodynamics (waves, currents and tides) and sediment transport processes in coastal, estuarine, nearshore and shallow marine environments, and conducting advanced analysis and interpretation of these data. Providing expert, research-informed advice on physical issues in the coastal zone.